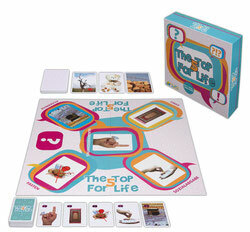 The top 5 for life is a combined card and board game in which players discover the 5 pillars of Islam. It's a great way to approach the big questions of life in a playful way and talk about them in a relaxed way. Who takes the lovingly illustrated picture cards and action cards in the hand, would like to start immediately! • Exciting questions! How do everyday life and religion go together in Islam? • Learn more! What is behind the TOP 5? • Have fun! Numerous picture and action cards provide a lot of variety. • Great conversations! TOP 5 For Life creates space for encounters, between cultures and different living spaces.